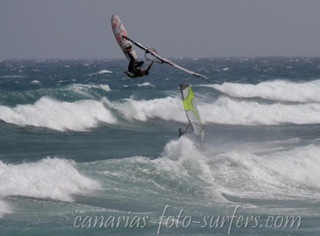 Last week turned out to be pretty good here in Gran Canaria. Tuesday in particular was full power 3.7 weather, which although in the summer is fairly common, in the winter it doesn't happen so much. On top of that there were a few waves too. Took a little while to get into it though. Thanks to Miguel for the pic. Next stop Maui, leaving today.